The OnePlus 5 has been launched in India, two days after the global launch of the phone. Here is a recap of the phone’s tech specs. The OnePlus 5 is powered by a Qualcomm Snapdragon 835 chipset, and will be available in two variants, one with 64GB of internal storage and 6GB of LPDDR4X RAM, and another with 128GB of storage and 8GB of LPDDR4X RAM. The storage chip on the device is based on UFS 2,1, and features Dual Lane Storage. The OnePlus 5 flaunts a 5.5-inch Optic AMOLED Full HD 1080p display with DCIP-3 color gamut. The GPU on the device is an Adreno 540. The OnePlus 5 runs on OxygenOS which is based on Android Nougat, and has some extra features such as PayTM Quick Pay integration, which work with the fingerprint scanner. There is a new reading mode, which uses the device's ambient light sensor, and some useful features like the two-finger swipe gesture for taking scrolling screenshots. Photography hardware on the OnePlus 5 includes dual rear cameras, one of which is a 20 megapixels Telephoto camera with a Sony IMX 350 lens and an f/2.6 aperture for fast auto focus, and a 16 megapixels Sony IMX 398 sensor which is the main camera with an f/2.6 aperture. The selfie lens on the OnePlus 5, is a 16 megapixels lens with a Sony IMX 371 sensor. The device has a USB Type-C port, a 3.5 mm audio jack, and a single speaker on the bottom of the device's frame. The phone houses a Ceramic fingerprint sensor on the front panel, and can unlock the device in just 0.2 seconds. The device is backed by a 3,300 mAh battery which supports Dash Charge. Connectivity wise, the OnePlus 5 supports Cat 12 LTE with VoLTE, 3CA (Carrier Aggregation), Bluetooth 5.0, NFC. The OnePlus 5 has been priced at Rs. 32,999 in India, for the 6GB RAM and 64GB storage model while the 8GB RAM and 128GB of Storage has bene priced at Rs. 37,999 . The phone will be sold exclusively via Amazon India's web store, and will be available for purchase, from 4:30 PM today (June 22nd) in a special early access sale. The OnePlus 5 will be available for purchase next on June 27th. The OnePlus 5 will be available in 2 colours: Midnight Black and Slate Gray. 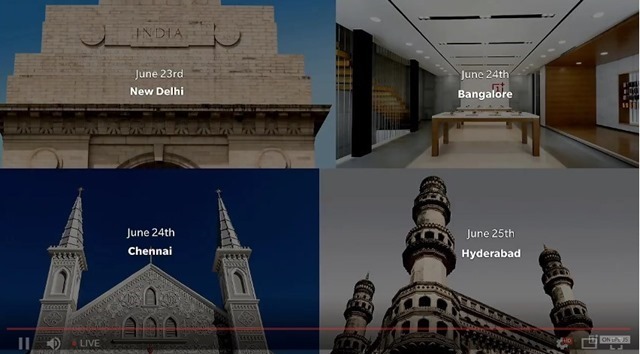 You can visit OnePlus pop-up events at Hyderabad, Chennai, Bengaluru and Delhi to buy a OnePlus 5 too. 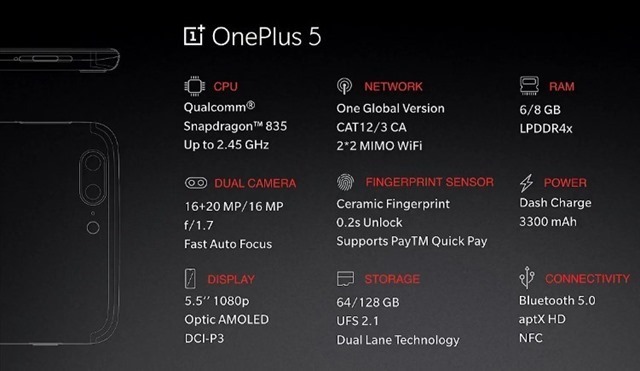 For a full list of the OnePlus 5’s technical specifications, please refer to our previous coverage.